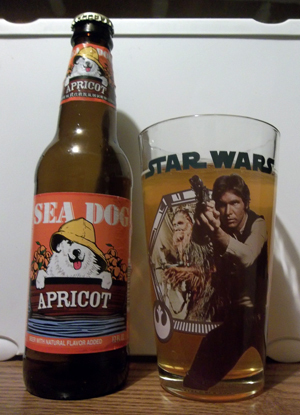 Review: Attack of the Fruit Beer! Today I turned to my Han Solo & Chewbacca pint glass with the beer pouring a clear yellow with a very thin white head which quickly vanished away. Some fruit beers don’t necessarily show any qualities of the said fruit, either in the aroma or taste. This is not the case with this Apricot Wheat Ale. The aroma is full on apricot, like walking by fresh apricots in your local grocery store. The taste of this beer is just as simple as the aroma. All I taste is apricot. It is light bodied, and not very carbonated. It’s actually very easy to drink, like drinking your morning glass of o.j. or something. I do have to say that this is a very tasty beverage, but not that pleasing if you are looking for something with a more “beer feel”. I would recommend this beer to your friend that is afraid of beer cause of past experiences, or of course this one will be good for the ladies! Will I drink this one again…sure, if purchased for me, but I will not go out of my way for this one. As for my Metal Connection with this beer, I chose Seasons in the Abyss by Slayer cause this is an easy song to listen to by this band. Just as this beer is a gateway beer, so is this song. I know people on the border of liking Metal who like this song, just as this beer will be on the border for those wanting to cross into craft beer. Switched glasses for this one. I used my 2012 San Antonio Beer Week glass. This beer poured a light amber color with a thin white head that seemed to stick around the entire time. 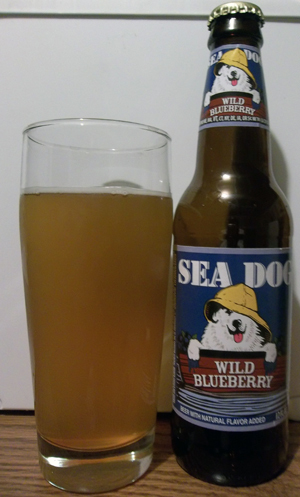 Well Sea Dog, you did it again. You simply called it what it is…a true fruit beer. My Metal Connection isn’t exactly Metal, but the first band that came to mind after I mentioned eating Blueberry Shredded Wheat was Misfits. It’s because I was also thinking about Boo Berry cereal. hahaha!